ResourceBundleViewResolver is a ViewResolver which uses ResourceBundle property file for bean definitions. Property file is located in classpath. A bean of ResourceBundleViewResolver is created and base property file name is configured using setBasename() . We achieve internationalization using ResourceBundleViewResolver. In ResourceBundle property file, there are key-value pair values. The key will be created using (string value returned by controller method + attribute of different view classes like JstlView and RedirectView). result. (class): This is a key which will be used to assign view class like JstlView and RedirectView . Here result is a string value retuned by controller method. result.url : For the result value, we need to assign page. The default file name is views. We can use any name, but base name needs to configure with ResourceBundleViewResolver using its setBasename() method. For i18, we can create different file name with different language code. Find the property file. Here we are configuring data for two retuned values of controller method. Our resource bundle file is for en language code. Hence file name is appended with _en. Find the project structure in eclipse. The property file will be kept in classpath. 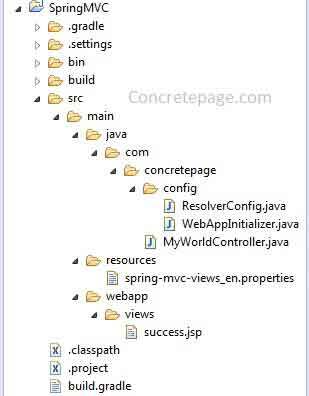 Find the java configuration file to define ResourceBundleViewResolver bean. Find the controller class. Here we have two methods one for testing JstlView and second for RedirectView. We are creating a JSP file to test JstlView. Build and deploy WAR in tomcat, and access URL to test JstlView. to test RedirectView, we will be redirected at our given absolute URL.